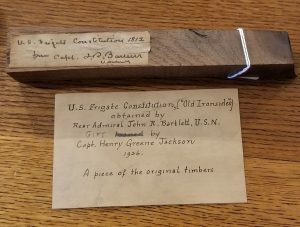 Here’s another small (but fascinating) piece of history tucked away in the Varnum Memorial Armory Museum. 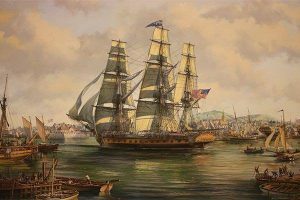 This is a piece of the famed US Frigate “Constitution”, known as “Old Ironsides” for its defeat of five British warships during the War of 1812. 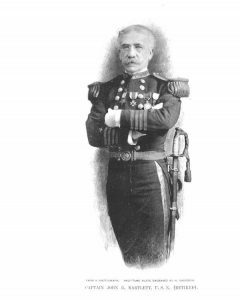 The piece was owned by Rear Admiral John R. Bartlett of Lonsdale, RI, who served with distinction from the American Civil War until the Spanish American War. He was also a founding member of the National Geographic Society. 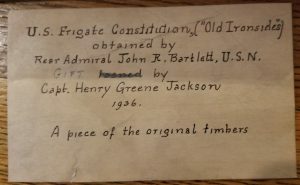 His friend, Captain Henry Greene Jackson, was an early Varnum Continentals member who donated it to us in 1936.